Diary Cottage is a comfortable, two bedroom property, which has been converted from an 18th century Grade II listed dairy (shown left). It lies within a mile of the hamlet of Bolventor and Jamaica Inn of Daphne du Maurier fame. Adjoining the owners' farmhouse, it makes a perfect base for enjoying wonderful walks in moorland scenery dotted with Bronze Age settlements, fishing and sailing on nearby reservoirs, and riding and cycling on the Camel Trail. Both north coast beaches and south coast fishing harbours and the Eden Project are all about 30 minutes' drive. Pub ¾ mile, shop 5 miles. Bolventor is situated in the middle of Bodmin Moor and consists of a church and a few houses. The most famous thing about this village is that it was once an important coach stop. Jamaica Inn served travellers with food and board and was also reputedly the haunt of many local smugglers. 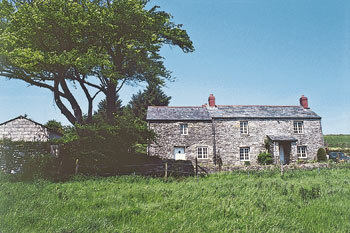 Guests can explore the surrounding, isolated, unspoilt countryside of Bodmin Moor. Dozmary Pool, which is south of Bolventor, is also famous through legend, which recounts that King Arthur after being fatally wounded, ordered that the sword Excalibur be thrown in the Dozmary Pool and when this was done a lady's hand rose from the lake, caught the sword and held if aloft before disappearing into the depths beneath. Two bedrooms. 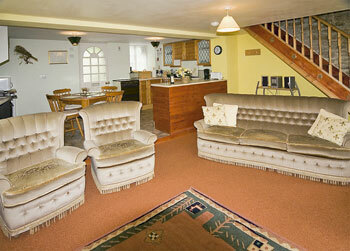 Open plan sitting room with well equipped kitchen/dining area and oil Rayburn and electric cooker. First floor: Double bedroom. Twin bedded room. Bathroom/W.C. (shower over bath).